EAST RUTHERFORD, New Jersey -- The New York Giants didn't have to look far to find a replacement for Tom Coughlin. Offensive coordinator Ben McAdoo has been promoted to take over the team that has missed the playoffs the past four seasons, the team announced Thursday. The 38-year-old McAdoo has been on the fast track since reviving the offense over the past two seasons. He got the first interview for the job after Coughlin, 69, stepped down after 12 seasons. McAdoo made an immediate impression. The coaching search lasted less than 10 days. The Giants have liked what McAdoo has done with the offense the past two seasons, helping two-time Super Bowl MVP quarterback Eli Manning get back on track. It didn't hurt that Manning voiced support for his coach after the season. This is McAdoo's first head coaching job. It's unclear whether defensive coordinator Steve Spagnuolo, who also interviewed for the top job, will stay. "Excited for Coach McAdoo," cornerback Prince Amukama said in a text to The Associated Press. "I figured him or Spagz would have been a great pick. I'm sure his players and the fans are all excited." McAdoo would be the NFL's second youngest coach. Adam Gase, the Chicago Bears offensive coordinator who was hired by the Dolphins, is 37. The Giants interviewed six men after Coughlin stepped down. They intended to interview Cincinnati offensive coordinator Hue Jackson on Thursday, but he accepted the Browns job hours before the Giants decided on McAdoo. 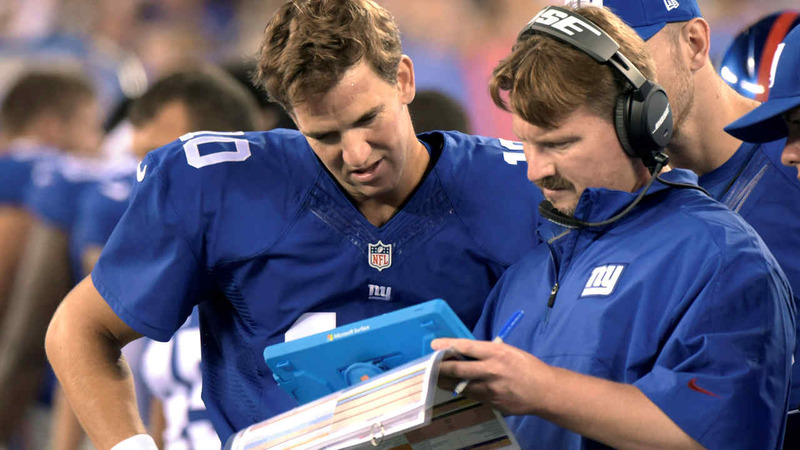 McAdoo also impressed the Philadelphia Eagles when he interviewed for their coaching vacancy. Under McAdoo's leadership, Manning threw 65 touchdowns and 28 interceptions the past two seasons. He has 18 touchdowns and 27 interceptions in 2013. McAdoo learned under Coughlin and has shown some of the same attitudes as his 69-year-old mentor. He is not afraid to gamble. In the season opener against Dallas this past season, he went for the win, calling a pass play on third down in the red zone in the closing minutes. A touchdown would have iced the game. Instead, Manning made a mistake throwing the ball away and that stopped the clock. New York kicked a field goal to take a six-point lead but the extra time allowed Dallas to come back and win the game late. That aggressive play calling, though, has been a part of McAdoo's game. He believes in his offense and he is not afraid to put the game in the unit's hands. McAdoo joined the NFL in 2004 as an offensive quality control assistant with the New Orleans Saints, spent a year with the 49ers the following year and then joined the Green Bay Packers for the next eight seasons, working with the tight ends and the final two years as Aaron Rodgers' quarterback coach. The Giants hired him in 2014 to replace Kevin Gilbride and his version of the West Coast offense - and the addition of Odell Beckham Jr. - has helped revive the offense.